MAC address based filtering ensure that only a known set of devices in the system are able to obtain an IPAddress from the DHCP. Reservation and Exclusion, two incredibly different concepts. An exclusion is an address or range of addresses taken from a DHCP scope that the DHCP server is notallowed to hand out. For example, if you have set a DHCP server to exclude the address range 192.168.0.1-192.168.0.10 then the only way a computer on your network would get an address of 192.168.0.4 would be ifyou assigned it statically on that machine. This is because DHCP knows NOT to give this range of IPaddresses out. A reservation is a specific IP addresses that is tied to a certain device through its MAC address. Forexample, if we have a workstation on the network that requires a certain IP address, but we don’t want to gothrough to trouble of assigning it statically, then we can create a reservation for it. So if the MAC address of theNIC on the computer is AA-BB-00FF-CC-AA and we want it to maintain the IP address of 192.168.0.100 thenwe would create a DHCP reservation under that particular scope saying that the IP address 192.168.0.100 is reserved only for the MAC address AA-BB-00-FF-CC-AA. All domain controllers are DNS servers. In the corp.contoso.com domain, you plan to deploy a new domain controller named DCS. You need to identify which domain controller must be online to ensure that DCS can be promoted successfully to a domain controller. Which domain controller should you identify? Relative ID (RID) Master: Allocates active and standby RID pools to replica domain controllers in the same domain. (corp.contoso.com) Must be online for newly promoted domain controllers to obtain a local RID pool that is required to advertise or when existing domain controllers have to update their current or standby RID pool allocation. The RID master is responsible for processing RID pool requests from all domain controllers in a particular domain. When a DC creates a security principal object such as a user or group, it attaches a unique Security ID (SID) to the object. This SID consists of a domain SID (the same for all SIDs created in a domain), and a relative ID (RID) that is unique for each security principal SID created in a domain. Each DC in a domain is allocated a pool of RIDs that it is allowed to assign to the security principals it creates. When a DC’s allocated RID pool falls below a threshold, that DC issues a request for additional RIDs to the domain’s RID master. The domain RID master responds to the request by retrieving RIDs from the domain’s unallocated RID pool and assigns them to the pool of the requesting DC At any one time, there can be only one domain controller acting as the RID master in the domain. Your network contains an Active Directory domain named contoso.com. You log on to a domain controller by using an account named Admin1. Admin1 is a member of the Domain Admins group. You view the properties of a group named Group1 as shown in the exhibit. (Click the Exhibit button.) Group1 is located in an organizational unit (OU) named OU1. You need to ensure that users from Group1 can modify the Security settings of OU1 only. What should you do from Active Directory Users and Computers? B. Would delegate control to the whole domain. C. Delegates control to the OU OU1 only. An organizational unit is the smallest scope or unit to which you can assign Group Policy settings or delegate administrative authority. A user can have administrative authority for all organizational units in a domain or for a single organizational unit. You can delegate administrative control to any level of a domain tree by creating organizational units within a domain and delegating administrative control for specific organizational units to particular users or groups. Administrative control can be assigned to a user or group by using the Delegation of Control Wizard or through the Authorization Manager console. Both of these tools allow you to assign rights or permissions to particular users or groups. C. Install the DNS Server role. In the perimeter network, you install a new server named Server1 that runs Windows Server 2012 R2. Server1 is in a workgroup. You need to perform an offline domain join of Server1 to the contoso.com domain. What should you do first? B. Use djoin for offline join in the perimeter network. Your network contains two Active Directory forests named adatum.com and contoso.com. Both forests contain multiple domains. A two-way trust exists between the forests. The contoso.com domain contains a domain local security group named Group1. Group1 contains contoso\user1 and adatum\user1. You need to ensure that Group1 can only contain users from the contoso.com domain. Which three actions should you perform? To answer, move three actions from the list of actions to the answer area and arrange them in the correct order. Domain local Groups that are used to grant permissions within a single domain. Members of domain local groups can include only accounts (both user and computer accounts) and groups from thedomain in which they are defined. A domain local group is a security or distribution group that can contain universal groups, global groups, other domain local groups from its own domain, and accounts from any domain in the forest. You can give domain local security groups rights and permissions on resources that reside only in the same domain where the domain local group is located. A global group is a group that can be used in its own domain, in member servers and in workstations of the domain, and in trusting domains. In all those locations, you can give a global group rights and permissions and the global group can become a member of local groups. However, a global group can contain user accounts that are only from its own domain. A universal group is a security or distribution group that contains users, groups, and computers from any domain in its forest as members. You can give universal security groups rights and permissions on resources in any domain in the forest. Universal groups are not supported. Domain local -Groups that are used to grant permissions within a single domain. Members of domain local groups can include only accounts (both user and computer accounts) and groups from the domain in which they are defined. Built-in local – Groups that have a special group scope that have domain local permissions and, for simplicity, are often referred to as domain local groups. The difference between built-in local groups and other groups is that built-in local groups can’t be created or deleted. You can only modify built-in local groups. References to domain local groups apply to built-in local groups unless otherwise noted. Global -Groups that are used to grant permissions to objects in any domain in the domain tree or forest. Members of global groups can include only accounts and groups from the domain in which they are defined. Universal – Groups that are used to grant permissions on a wide scale throughout a domain tree or forest. Members of global groups include accounts and groups from any domain in the domain tree or forest. Global to universal. This conversion is allowed only if the group that you want to change is not a member of another global scope group. Domain local to universal. This conversion is allowed only if the group that you want to change does not have another domain local group as a member. Universal to global. This conversion is allowed only if the group that you want to change does not have another universal group as a member. Universal to domain local. There are no restrictions for this operation. Your network contains an Active Directory domain named contoso.com. You discover that when you join client computers to the domain manually, the computer accounts are created in the Computers container. You need to ensure that new computer accounts are created automatically in an organizational unit (OU) named Corp. Which tool should you use? Redirects the default container for newly created computers to a specified, target organizational unit (OU) so that newly created computer objects are created in the specific target OU instead of in CN=Computers. You must run the redircmp command from an elevated command prompt. Redircmp.exe is located in the C:\Windows\System32 folder. You must be a member of the Domain Admins group or the Enterprise Admins group to use this tool. You have a server named Server2 that runs Windows Server 2012 R2. Server2 has the Hyper-V server role installed. The disks on Server2 are configured as shown in the exhibit. (Click the Exhibit button.) You create a virtual machine on Server2 named VM1. You need to ensure that you can configure a pass-through disk for VM1. What should you do? You need your virtualized workloads to connect easily and reliably to your existing storage arrays. WindowsServer 2012 provides Fibre Channel ports within the guest operating system, which allows you toconnect to Fibre Channel directly from within virtual machines. This feature protects your investments inFibre Channel, enables you to virtualize workloads that use direct access to Fibre Channel storage, allows youto cluster guest operating systems over Fibre Channel, and provides an important new storage option forservers hosted in your virtualization infrastructure. With this Hyper-V virtual Fibre Channel feature, you can connect to Fibre Channel storage from within a virtualmachine. This allows you to use your existing Fibre Channel investments to support virtualized workloads. Support for Fibre Channel in Hyper-V guests also includes support for many related features, such as virtualSANs, live migration, and MPIO. Offline Files transition between the three modes online, slow link and auto offline depending on connection speed. The user can always override the automatic mode selection by manually switching to manual offline mode. To determine the connection speed two pings with default packet size are sent to the file server. If the average round-trip time is below 80 ms (Windows 7) or 35 ms (Windows 8), the connection is put into online mode, otherwise into slow link mode. The latency value of 35/80 ms is configurable through the Group Policy setting Configure slow-link mode. Reads, Writes and Synchronization. In online mode, changes to files are made on the file server as well as in the local cache (this induces a performance hit – see this article for details). Reads are satisfied from the local cache (if in sync). In slow link mode, changes to files are made in the local cache. The local cache is background-synchronized with the file server every 6 hours (Windows 7) or 2 hours (Windows 8), by default. This can be changed through the Group Policy setting Configure Background Sync. . In auto offline mode, all reads and writes go to the local cache. No synchronization occurs. . In manual offline mode, all reads and writes go to the local cache. No synchronization occurs by default, but background synchronization can be enabled through the Group Policy setting Configure Background Sync. C. From Server Manager, add the Group Policy Management feature. To allow PPTP tunnel maintenance traffic, open TCP 1723. To allow PPTP tunneled data to pass through router, open Protocol ID 47. Your network contains an Active Directory domain named adatum.com. The computer accounts for all member servers are located in an organizational unit (OU) named Servers. You link a Group Policy object (GPO) to the Servers OU. You need to ensure that the domain’s Backup Operators group is a member of the local Backup Operators group on each member server. The solution must not remove any groups from the local Backup Operators groups. What should you do? Restricted groups allow an administrator to define two properties for security-sensitive groups (that is,”restricted” groups). The two properties are Members and Member Of. The Members list defines who should and should not belongto the restricted group. The Member Of list specifies which other groups the restricted group should belong to. When a restricted Group Policy is enforced, any current member of a restricted group that is not on theMembers list is removed. Any user on the Members list which is not currently a member of the restrictedgroup is added. The Restricted Groups folder is available only in Group Policy objects associated with domains, OUs,and sites. The Restricted Groups folder does not appear in the Local Computer Policy object. If a Restricted Group is defined such that it has no members (that is, the Members list is empty), then allmembers of the group are removed when the policy is enforced on the system. If the Member Of list is emptyno changes are made to any groups that the restricted group belongs to. In short, an empty Members listmeans the restricted group should have no members while an empty Member Of list means “don’t care” whatgroups the restricted group belongs to. Your network contains an Active Directory domain named contoso.com. All servers run Windows Server 2012 R2. An application named Appl.exe is installed on all client computers. Multiple versions of Appl.exe are installed on different client computers. Appl.exe is digitally signed. You need to ensure that only the latest version of Appl.exe can run on the client computers. What should you create? A. A publisher rule for a Packaged app is based on publisher, name and version. C. For .msi or .msp. A. Allows configuration of computers. B. User Rights Assignment policies determines which users or groups have logon rights or privileges on thecomputer. C. Restricted Groups defines what member or groups should exist as part of a group. A. Storage Pools use unallocated space. There is no way to create a storage pool with existing data. Storage pools are only a collection ofdrives that are managed by windows. MBR max is 2TB, the disk must be GPT. For any hard drive over 2TB, we need to use GPT partition. If you have a disk larger than 2TB size, the rest ofthe disk space will not be used unless you convert it to GPT. An existing MBR partition can’t be converted to GPT unless it is completely empty; you must either deleteeverything and convert or create the partition as GPT. It is not possible to boot to a GPT partition, impossible to convert MBR to GPT without data loss. 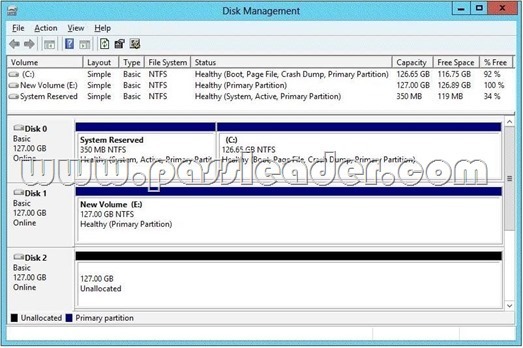 D. On Server1, run setup.exe from the Windows Server 2012 R2 installation media and select Server Core Installation. When the installation is complete, add the Server Graphical Shell feature. A. Adds specific types of objects to the directory. B. You can manage remote server by Server Manager and install roles/features.